Garage Door Repair Doctors At Your Service! Your automatic garage door system is incredibly complex, and its performance relies on the good working condition of many moving parts. When one of these components breaks down, the entire system can be rendered inoperable. A professional technician is always required when dealing with such a problem, as the various risks involved can make things extremely dangerous. Our technicians specialize in preforming this procedure. Your garage door springs can be extremely dangerous when mishandled; therefore even simply adjusting them requires an expert's assistance. When they break, the entire door can end up collapsing, especially if you try to use it. You should give our team a call whenever you find yourself faced with such a scenario. We can take care of it safely and quickly. As the motor the powers your door's operation, the opener can be susceptible to a variety of different problems. From worn out motor gears to malfunctioning circuit boards, there's no part of this electro-mechanical unit that our technicians can either repair or replace for you. The track is what guides your door's movement and ensures that it is steady and safe. However, if it develops bends, or becomes dirty and blocked by an accumulation of debris, it could cause your door to get stuck, or lead to your rollers slipping off. Our team can repair bent tracks and restore their proper condition as necessary. If one of your rollers broke, we can replace it with a new one of a similar or a superior quality. 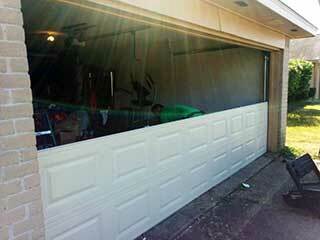 Our experts at Garage Door Repair Encino are ready to help you out of any jam. Regardless of which part of your door is suffering from a problem, you can rest assured in knowing that when you contact us, you're contacting the best service provider around. Call us today.